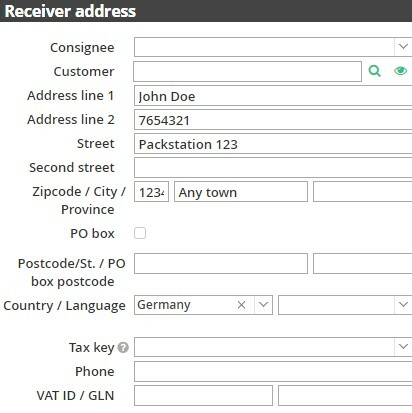 Would you like to print your address labels directly from reybex? Simply connect the business customer account (of your logistics partners) with reybex. If you would like to connect other logistics partners (FedEx, DACHSER, DB Schenker, Swiss Post, DPD Austria), please contact our support team. You will find instructions in our documentation Setup printers. The labels are now created for each document: One PDF each to download or print. Delivery notes and labels are printed in the same order. Pack packages according to the delivery notes and prepare them for dispatch. If you have created a shipping label in reybex, you will see the corresponding data in the sales document. You can also edit and add them later. With the plus button New you can enter a package manually. You can edit a package marked with a check mark by clicking the Edit pencil icon. Postal number in address line 2 (The postal number is on the Packstation customer card and in the customer account of the recipient).